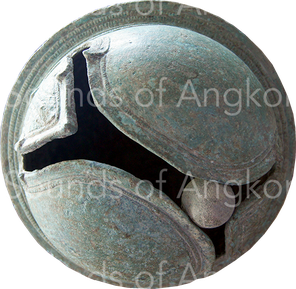 Animal bells - Site de soundsofangkor ! The animal bells are present in the iconography: horses, cows and elephants. As many of them were in bronze, numerous objects were found in the archaeological excavations. Bells are derived in shape from two basic forms: the cup and the hollow sphere. The cup form, also called the 'open' bell, appears in a great variety in design especially carried by elephants. It was probably carried by cows and buffaloes but the iconography doesn't show them. 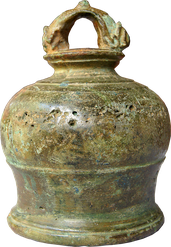 Today, but formerly probably too, bells of 'open' are made of different materials: bronze, iron, bone, wood, bamboo in different shapes according animals and areas. 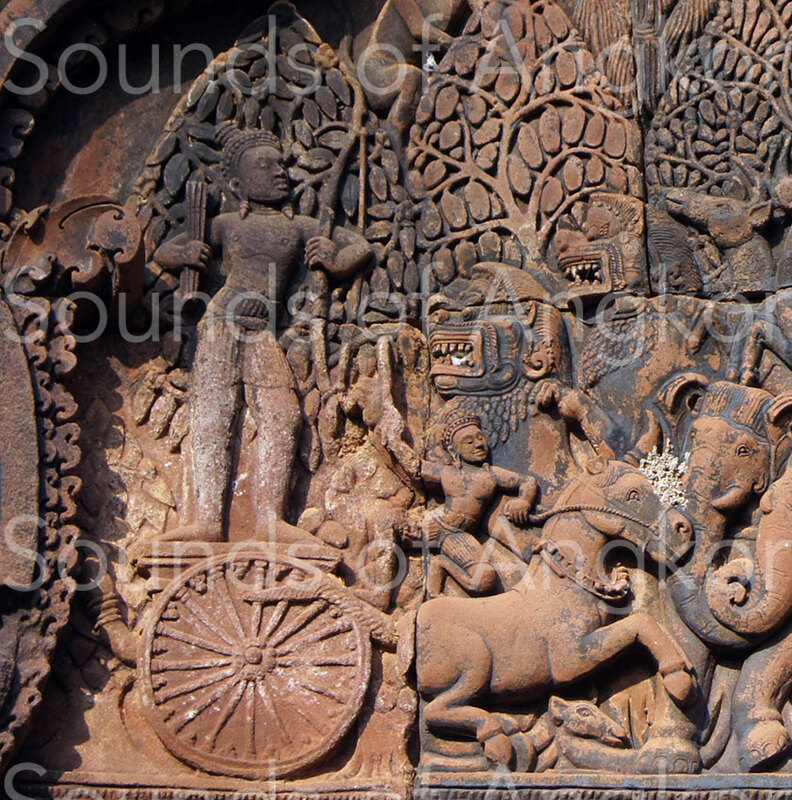 Elephants in battle or parade are represented with five bells of 'open': one around the neck and two on each flank. There are as many models as there are representations. The Elephant Terrace conceals several in the round at the scale 1. 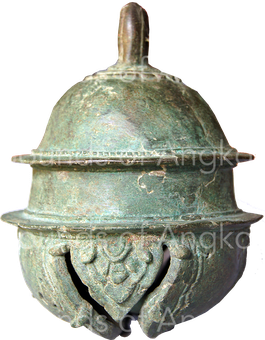 Elephant bell with lotus decoration on the top. Elephant terrace. Battle elephant with five bells: one around the neck and two on each flank. Bayon. 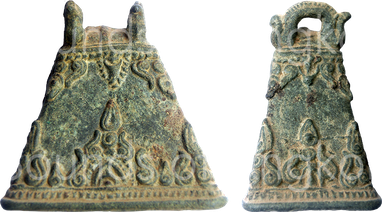 Bronze pyramidal bells have been discovered in various places in Cambodia and Thailand without it being possible to define their role. Their four faces are smooth or decorated. 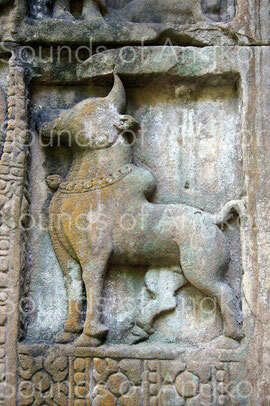 The bells are omnipresent on the bas-reliefs, represented at the neck of cattle, horses and elephants. Archaeological excavations provide many copies. The oldest dates back to the Bronze Age. They are of different sizes, worn unitarily or in collar. 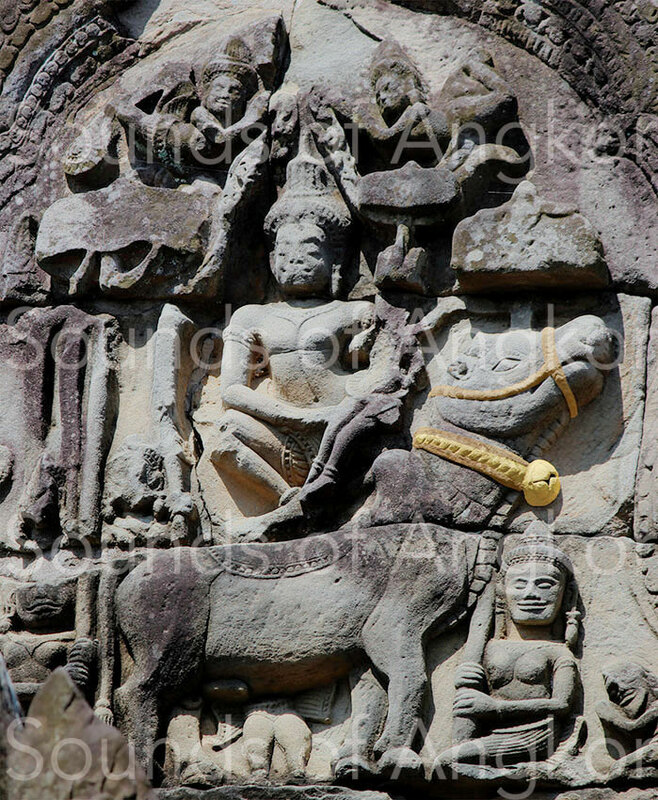 Yesterday, as today, the Khmer peasants adorn their cows with collars of small bells of 'closed' and sometimes with a big bell in the middle of it. Bell collar with large central bell. Bayon. Late 12th - Early 13th c.
Bell collar. 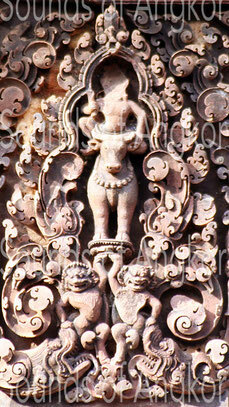 Banteay Srei. 10th c.
Bell collar with large central bell. Baphuon. 11th c.
The horses of war are adorned with majestic bell collars. Iconography and archeology bring us many testimonies. The equine bells are made up of spaced or tight elements, with one or two rows, sometimes a single big central bell. There are spherical, piriform and mango-shaped bells. In the Elephant Terrace, there is clearly distinguished by the high relief a combination of two bell collars: one composed of spherical bells and the other of mango-shaped bells. 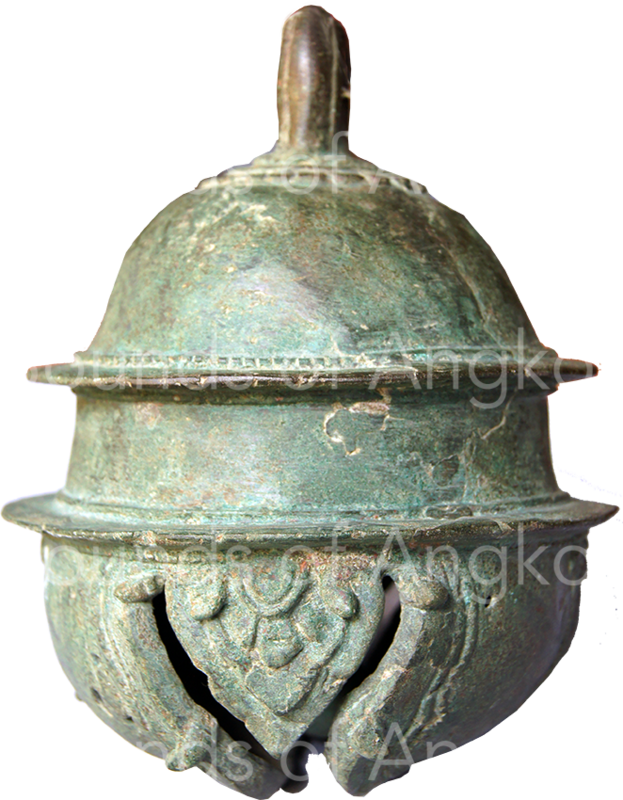 Mango-shaped bell in bronze corroborating the sculptures opposite. 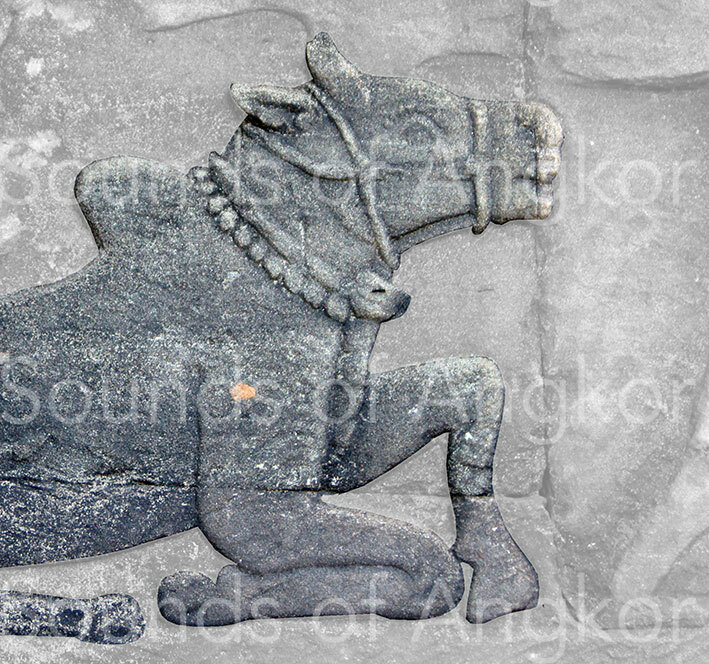 Angkorian period. Wat Bo coll., Siem Reap. 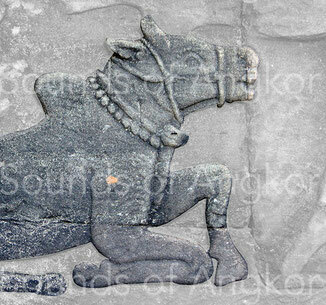 Reconstitution proposal of the horse bell collar of the Elephant Terrace by Patrick Kersalé. Three bell collars with double row. Elephant Terrace. 13th c.
Horse bell collar with double rows of bells, some round, others mango-shaped. Elephant Terrace. 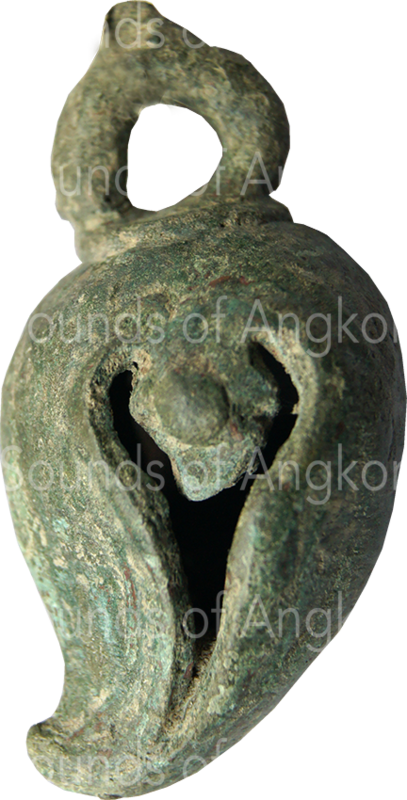 13th c.
X-shaped mouth bells are little detectable but rare in the Khmer sculpture. 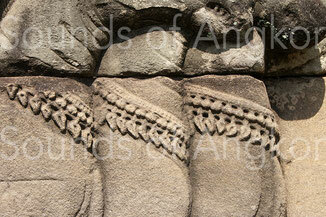 One of them is visible at the neck of a bovid at the Banteay Samre temple. They are frequently decorated with floral elements. 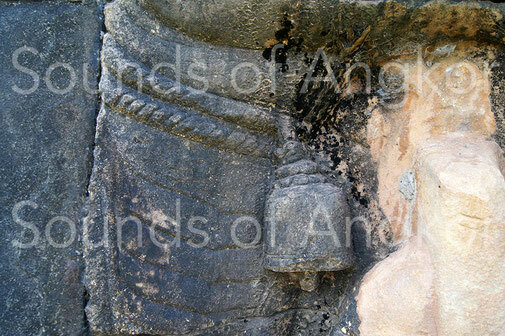 Their periphery is circled by two broad edges separating the resonant part of the bell from the body of the animal. 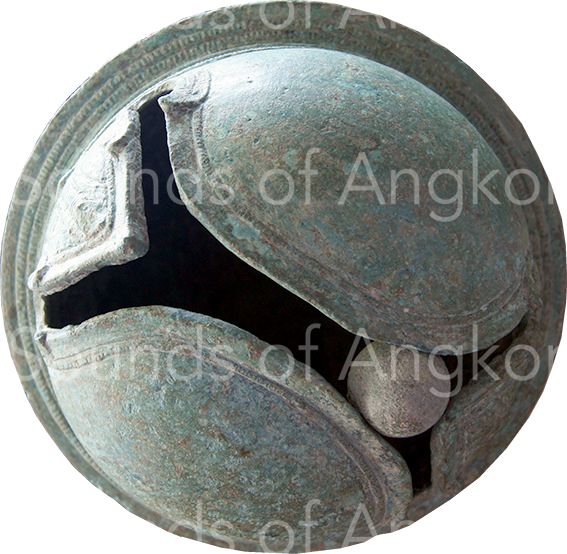 An alloy ball similar to the body is trapped in the bell. On a few specimens studied, the two broad sections on either side of the X-shaped mouth produce two distinct notes. But given the oxidation of most of the specimens, we cannot generalize. One of the rare sculpture of a X-shaped bell at the neck of Nandi, the vehicle of Śiva. Banteay Samre. 12th c.
Elephant bell and its pellet. 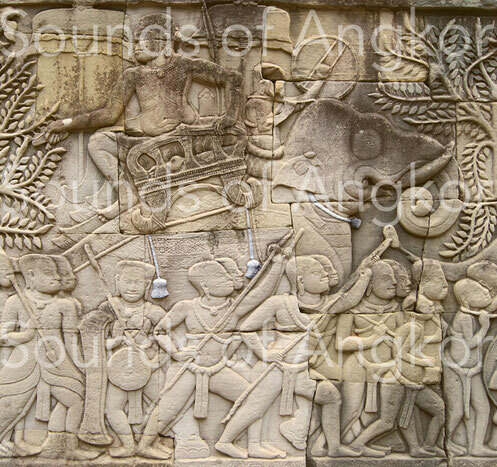 Angkorian era. Wat Bo coll. The unique sculpture of an elephant X-shaped bell of 'closed' at its neck. 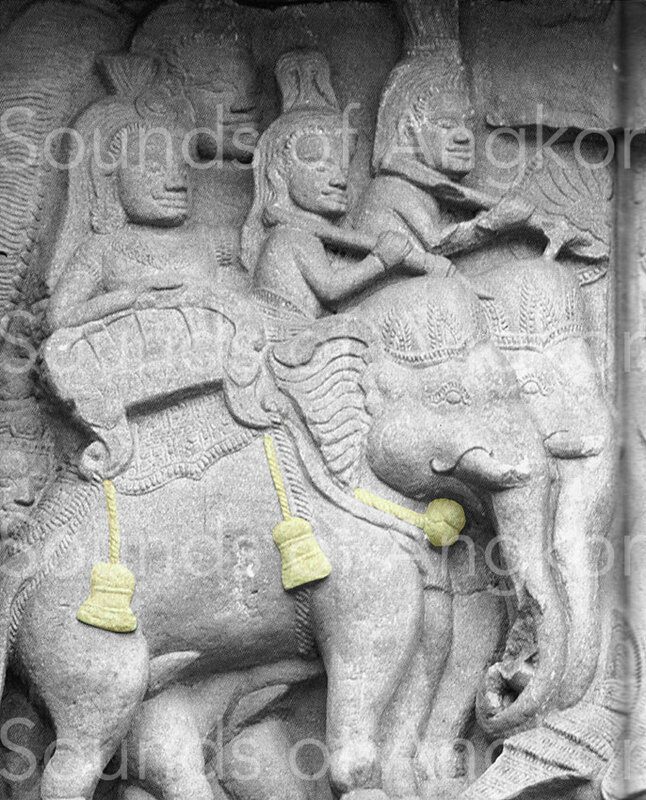 Phanom Rung, Thailand. Elephant bell. Angkorian era. Wat Bo coll.